Above is a shot of 8 Red Roses against a Textured Wall. This shot was taken at the Entrance gate of "Jal Dhara" Jaipur, a place where young couples go to spend some time with each other. It is basically a garden that is host to a lot of water fountains. While I was on my way out of that garden (mind you, I was out there only for a photo-walk) I found these set of roses lying in a plastic bucket that belonged to an old woman. That old woman was actually selling red roses right outside the gate to couples. While composing the shot, I placed the 8 Red Roses on the bottom left of the frame and left a lot of empty or Negative Space on the sides to make the image look more Minimalistic. 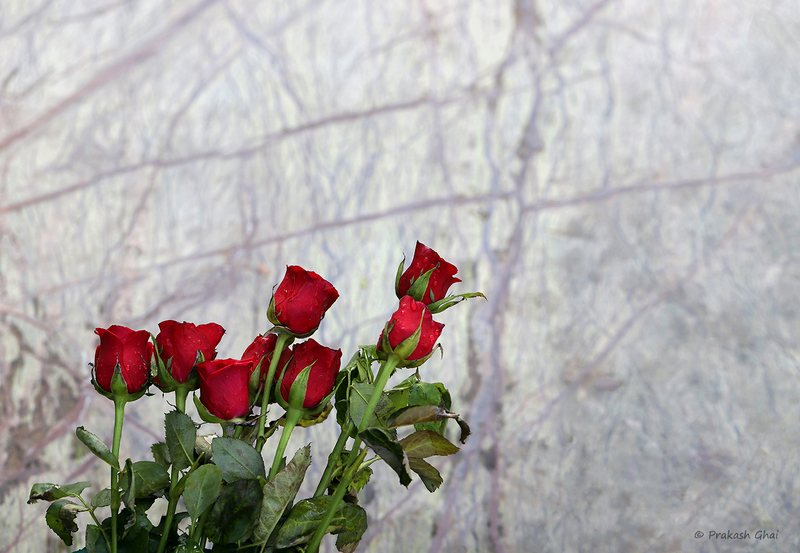 The Decayed Textured Wall at the back adds a nice contracts to the fresh Red Roses. The photo falls under the Minimalism as Less Elements category of Minimalist Photography. Hope that you enjoyed the photograph.